Gardening is an activity that asks for a lot of effort regularly. It is not like you can attend your garden every weekend and expect something very beautiful to come out of the process. It does not work that way. You need to devote time and effort to it on a regular basis right from the start in case you want to have something worth flaunting. Although it is recommended that you leave the garden soil bare for a reasonable span of time after preparing it, you do not need to wait for years to plant your garden. Preparing the garden bed for planting vegetables includes a number of steps. You may begin with digging out the area of your vegetable garden and analyzing the texture of the soil. Start with creating the perimeter first. This will give you a good idea as to where to focus your efforts into. Dig the edge of the garden area before you break the ground in-between. Next, you should remove the top layer of sod using a shovel. In case, the garden area does not have any grass; you just need to remove all of the weeds, rocks, and debris from the soil. Make sure that the soil is the right mixture of sand, soil, and clay. Too much of any component will result in poor plants. An excess of sand makes the soil dry, while too much of clay is going to result in wet soil. Thus, make sure that your garden soil is the right combination of earth, sand, and clay. In case you can’t figure it out yourself, consider sending a sample of your garden soil to the nearest garden center and for getting it professionally analyzed. 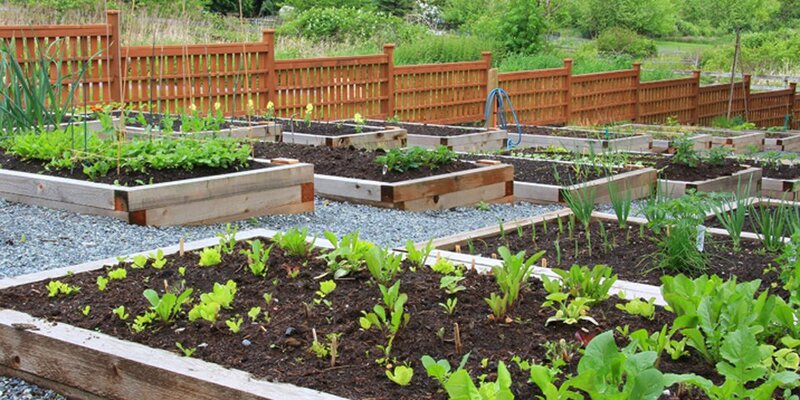 The next tip for having a good garden bed for planting vegetables is to cultivate the soil well. Till the soil well as it will break all the lumps in the soil and prepare it well for planting vegetables or anything else. It is recommended that you till the soil up to 12-inches deep. You may use a rototiller for tilling. Not only will this make the entire process quite comfortable but also make it faster. Do not forget to remove all the rocks and debris as you till the soil. Removing them will help the garden have an even texture, thus promoting plant growth. Also, it will make your garden look more appealing and beautiful. Fertilization is essential for healthy plant growth. It is an important step in preparing the soil for plantation. You can choose anything out of compost, humus or manure as per your requirement, budget and preference. It is crucial to spread the fertilizer evenly all around the garden soil for it to yield desired results. You may make use of litter spreaders or lime and fertilizer spreaders for this. The tools are indispensable to gardening and are a must-have. Top soil is the fertile layer of the soil. It is the soil that actually supports and promotes healthy plant growth. However, it is not necessary that your garden would have some quality top soil by default. In a majority of the cases, the garden beds are devoid of fertile soil, resulting in poor plant growth. While preparing your garden bed for planting vegetables, you can add a decent layer of topsoil to the surface of your garden area. This can make up for the absence of fertile layer and promote healthy plant growth. The process is healthy for your garden and is as essential as adding compost to the soil. Quality topsoil allows you to plant stuff while the actual soil prepares itself for holding plants. Make sure that you leave the cultivated soil bare for a couple of days before planting. In case you feel like putting some extra effort into your garden, you may even turn the soil daily. However, the step can be skipped, once you feel that the soil is prepared well enough. Thus, these were some of the tips to prepare a garden bed for planting vegetables. Organic soil is the soil that has a rich content of humus in it. Humus is the end result of dead and decaying stuff like leaves, grass clippings, and compost. Organic soil is known for holding moisture but draining well. Plants grown in organic soil are healthier and natural. Quality organic garden soil must be loose and fluffy. Thus, you need to keep it in mind while preparing soil the next time. It must be filled with air as roots of the plants need it, but it also must have an abundant supply of essential minerals necessary for quick and vigorous plant growth. Make sure that the soil is alive with living organisms. The goal is to merely maintain the quality of the soil. Apart from that, you must make sure that the soil has a proper pH. It must not be too acidic or too basic for plant growth. Having a healthy garden is not tough. You just need to have your basics clear. It all depends on the preliminaries. The idea can be compared to priming a wall before getting started with painting, how you prepare the soil and the plants is the foundation of your garden. Author Bio:Thomas M Strother is the blogger at spreaders.com which specialize in making spreaders and dump trucks from the last 24 years. They provide quality products in agricultural areas like lime and fertilizer spreader, construction and other needs from tailgate salt spreader to litter spreader. They make sure that customer requirements are full filled.